There were years of unrest around the time of the French Revolution. 1789–1799 were times of anxiety for the British Government. There were riots in Gloucestershire over bread prices and the introduction of power looms in the cloth mills of the Stroud area where there was strong support for the Chartists. Chartists wanted political rights and influence for the working class. The county also had trouble with farm labourers who were taking part in the ‘Swing Riots’ protesting against the introduction of threshing machines. The Government feared riots because without a police force there was no way of dealing with unrest without calling out the militia or regular troops. Though some towns had a more organised system of policing by 1839 most of the country still relied on the Parish Constables who were usually part time and unpaid and only had powers granted by the Parish.. London had a form of police from the 1750s and Cheltenham, Gloucester, Worcester, Bath and Bristol all had their own police forces by the time of Sir Robert Peel’s Constabulary Act 1839, which allowed counties to set up police forces paid out of the rates. There was some sort of policing in Gloucester from the 18th century when 12 Constables were appointed, 4 each in wards North & West and 2 each in Wards East & South. One of the Serjeants-at-Mace was appointed High Constable in 1769 to head the City Police. There was a ‘Police Office’ in 1817 at Bridewell, Southgate St. Gloucester. A more regular Watch was organised in 1821. The High Constable in 1827 was Mr George Williams. The Municipal Corporations Act 1835 authorised newly elected Borough Councils to form a Watch Committee and swear in sufficient number of fit men as Constables and in 10 days (11th – 21st January 1836) they decided to form a new Police Force for Gloucester. On 26th February the Force was on duty in Gloucester. John Marsh, described in 1826 as ‘the efficient police officer,’ was the new Superintendent and his deputy in the old Force, George Williams, stayed on as resident Sergeant having previously been the Keeper of the City Lock-Up in Southgate St. The remaining members of the new Force were 2 Sergeants and 12 Constables, giving a total of 16. 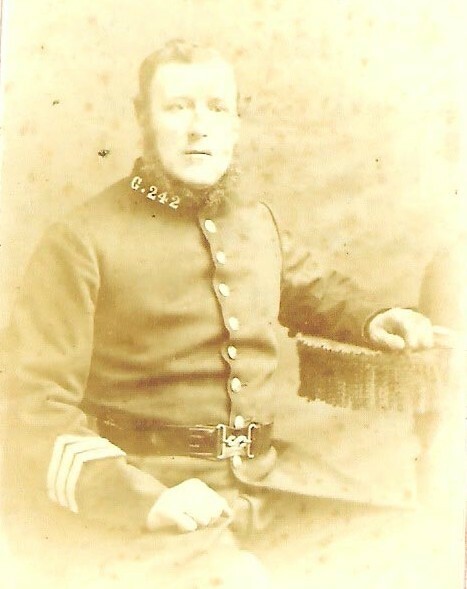 Cheltenham Town had a London Police officer as the supervising officer in 1821 and when he retired, George Russell, the Town Surveyor and High Constable, was appointed to Police Superintendent at £200 p.a. Formed with Superintendent John Martin, Assistant Officer, Richard Stallard and 4 Constables. In 1812 the number of Constables increased to 6. 1831 9 paid Constables were appointed together with 4 Assistants who were paid 3/- (15p) a night to patrol 6 Divisions between 10 pm and 6 am. In about 1836 Tewkesbury Police employed Sergeant Eaton of the Metropolitan Police but he only remained for two weeks. He was replaced by Police Constable Henry Rackham, again of the Metropolitan Police, who was sworn in a Sergeant and served for 2 years. There were also 4 Constables. Dursley set up its own police force in 1814 under the Parish Constable system and re-organised it in 1824 with 2 uniformed police constables and the Town Bailiff, Baptist William Hicks. Winchcombe also had a similar policing arrangement with 2 Borough Constables in 1826; this was then increased to 8 in May 1827. Stow employed 2 Metropolitan Police Officers in 1836, James Otway and George Millington. Metropolitan Police officers were also loaned to authorities at Andoversford, Bourton-on-the-Water, Cirencester, Cheltenham, Fairford and Minchinhampton. George Cooper (Cowper? 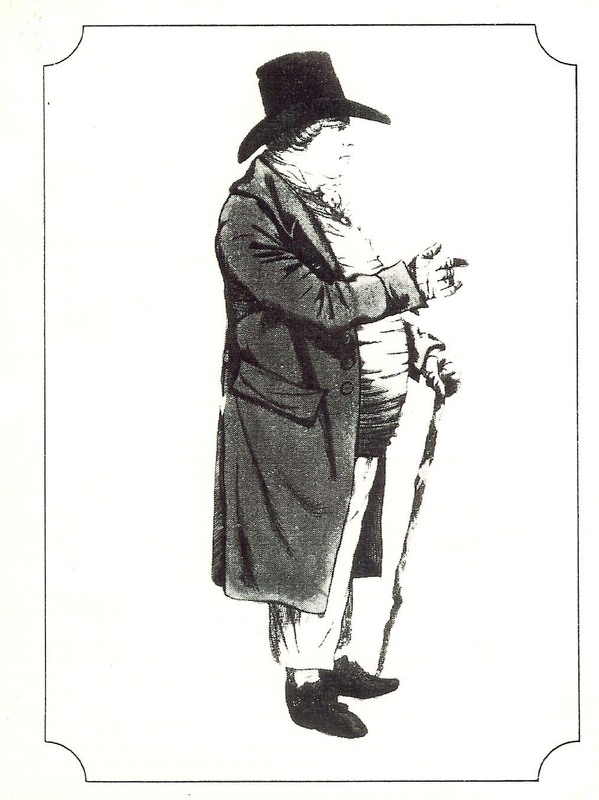 ), ex-Metropolitan Policeman, served at Bourton-on-the-Water from August 1834 to December 1836. 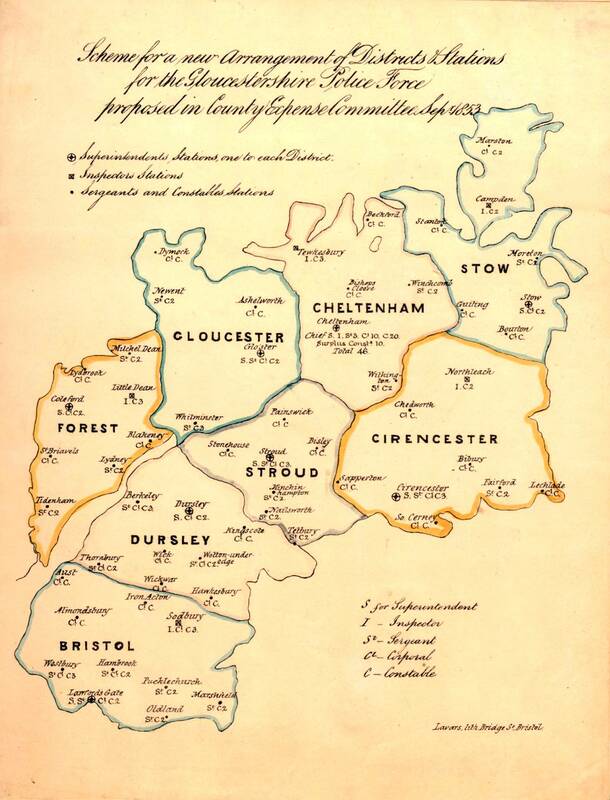 At a meeting at the Courts Quarter Sessions on 15 October 1839 it was proposed that the Constabulary Act of 1839 be adopted for Gloucestershire. The Clerk of the Peace received instructions to go about the business of raising a force of 250 men, that is to say one police officer per thousand population. The population of the county with the exception of Gloucester and Tewkesbury was at this time about 255,000. Before any other details of the Force were decided, the Justices concluded that a Chief Constable should be appointed as soon as was possible to superintend and co-ordinate the growth of the Force. It was suggested that Colonel MacGregor, the then Inspector General of the Royal Irish Constabulary, should be approached for the name of a suitable officer of his command for the post of Chief Constable of Gloucestershire. Colonel MacGregor replied on 14 November 1839 recommending one, Anthony Thomas Lefroy, who he described as an Englishman, aged about 36 years, from Cumberland, not an Army Officer. Mr Lefroy, the letter went on to say, had served for several years in the Royal Irish Constabulary to the satisfaction of the Inspector General. At a meeting of the Quarter Sessions held on 18 November 1839 Mr Lefroy, proposed by the Chairman and seconded by the Lord Lieutenant, was appointed as the first Chief Constable of the new Gloucestershire Constabulary. Districts and Stations of Gloucestershire Police in September 1853 and establishment at each station. This page was added on 08/08/2016.